BE, Gent. 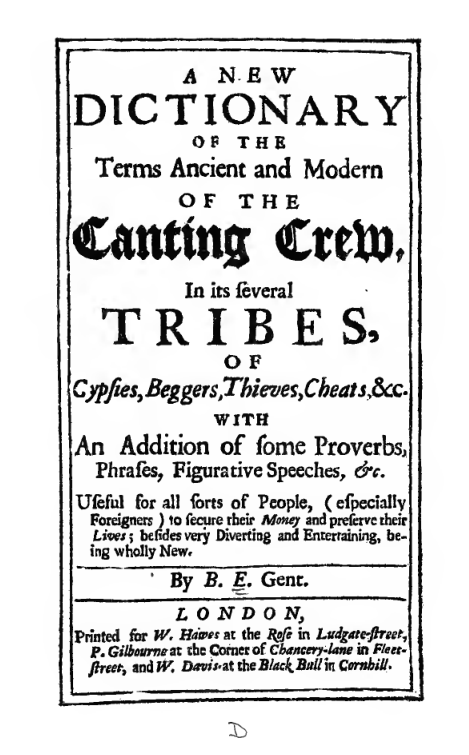 "A new dictionary of the terms ancient and modern of the canting crew." 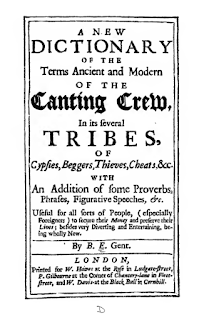 its Several Tribes, of Gypsies, Beggars, Thieves, Cheats, &c. With an Addition of Some Proverbs, Phrases, Figurative Speeches, &c. Useful for all Sorts of People (especially Foreigners) to Secure their Money and Preserve their Lives; besides very Diverting and Entertaining, being wholly New. London, c. 1698. Available at the Internet Archive. Cool. Back in the 80s I found a reprint of "The dictionary of the vulgar tongue" but that was from the 1800s I think.